Here's another first-rate recording of sacred works by living composers from one of America's finest church choirs; they're also one of America's foremost standard-bearers for Episcopalian church music. All of the works here — as in the previous album I reviewed from this group (Missa Orbis Factor) — have some sort of special connection to the cathedral, either via commission or performance history. All of the works are for organ-supported choir, save for Simon Preston's "Alleluyas," a stirring virtuoso piece for solo organ. The album's title piece — Malcolm Archer's Omnes Sancti Mass – is a compact, but supremely effective setting of the standard mass, sans Credo. The emphatic opening Kyrie immediately revealed distinct French stylistic echoes, bringing Vierne's Solemn Mass to mind. After the bright Gloria, the brief, light-hearted Sanctus leads directly into the like-toned, but even lighter Benedictus. The hushed Agnus Dei is especially sweet and pastoral. Before that, we hear very inspiring and accomplished shorter pieces by five other composers. Quinn's own rarefied settings of the Magnificat and Nunc Dimittis are heard first. Two fine pieces by Philip Moore follow: his bright and triumphant "Song of Christ's Glory" and the mostly quiet and stately (until its final climax) "He That Is Down Needs Fear No Fall." Between them we get Peter Hallock's delicate and dreamy Evensong piece, "The Lord is My light." Anthony Piccolo's delightful "O How Amiable" starts out as a sort of celestial dance, maintaining an irresistible, often lilting flow to the end. Well-known organist-composer David Briggs contributes "O Lord, Support Us," a marvel of gentle, yet intense entreaty (another good Evensong number). In addition to the title piece, the works by Quinn, Piccolo, and Briggs are recorded here for the first time. Any church composer would be pleased and proud to have first recordings from this superb choir. I'm in love with their exquisitely pure-sounding soprano section, in particular. Excellent sound engineering as well as a serviceable booklet complete a well-nigh impeccable package. This is a particularly successful record of contemporary music for choir and organ, either composed for or closely associated with the Cathedral of St John, Albuquerque, New Mexico, under its young Cardiff-born Director of Music, Iain Quinn, whose own impressive Magnificat and Nunc Dimittis opens the disc. What immediately strikes one here is that in the heart of New Mexico we have a dynamic Director of Music who brings to Southern American congregations and (in the recital programmes) audiences a strong combination of modern British church and organ music to set alongside counterparts from American composers, with such self-evident success. music-lovers, music-directors and their choirs alike. 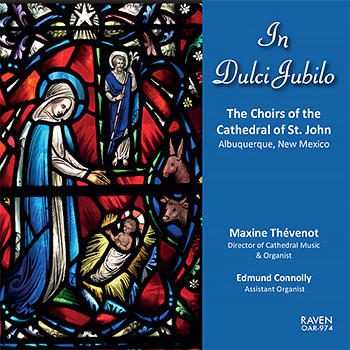 The performances under lain Quinn are also first-class and are excellently recorded; the text of each piece is also included, and the CD concludes with a fine performance by Maxine Thévenot (associate organist and choir director of the Albuquerque Cathedral) of Simon Preston's famous Alleluyas. Another highly recommended issue from this particularly interesting American record company. This recording follows the previous compact disc Missa Orbis Factor (Raven OAR-907) in presenting a number of works that have a special connection to the Cathedral either through commissions or performances, alongside other works in the Cathedral Choir’s repertoire and two organ solos. The setting of the Magnificat and Nunc dimittis by this author was commissioned for the 2007 conference of the Vergers Guild of the Episcopal Church held at the Cathedral of St. John, Albuquerque. It was first performed by the Cathedral Choir at the opening Evensong and subsequently given a UK premiere at Trinity College, Cambridge, in 2008 under the direction of Stephen Layton. The "Song of Christ’s Glory" by Philip Moore (B. 1943) was composed for The Salisbury Diocesan Choir Festivals 1982 with words taken from The South African Daily Office. It is a joyous, festal setting complete with a Gloria Patri that was written in 1981 when the composer was Organist and Master of the Choristers at Guilford Cathedral. After previous posts at Canterbury and Guilford Cathedrals, Philip Moore was appointed to York Minster in 1983, a position he held until his retirement in 2008 and is now Organist Emeritus. Peter Hallock (B. 1924) served for more than forty years leading the music department at St. Mark’s Cathedral, Seattle, continuing now as Director of The Compline Choir whose weekly services are attended by hundreds and broadcast throughout the world via the internet. In 1965, he oversaw the installation of the great Flentrop organ that remains a highly celebrated instrument in North America. Peter Hallock’s compositions are performed throughout the world and when the Cathedral Choir from Albuquerque undertook a tour to the UK in 2007, it was with particular joy to include The Lord is my Light in an Evensong at Canterbury Cathedral where Peter Hallock had sung many years before as a Lay Clerk. The piece is dedicated “To Les and Laura Martin and the Choir of St. Stephen’s Church, Seattle." The texts are taken from Psalm 21, v. 1; Psalm 139, v. 8; and Psalm 63, v. 4, 7. The setting by Philip Moore of Bunyan’s text He that is down needs fear no fall offers a contrasting voice, with its inner intensity and sense of “pilgrimage,” as the piece develops towards a glorious final crescendo. The anthem was written for Robert M. Speed and the Chancel Choir of Central Presbyterian Church, Des Moines, Iowa. Anthony Piccolo’s (B. 1953) setting of verses from Psalm 84 (Coverdale), O how amiable was commissioned by Pamela Green McClain and Harris McClain as part of the Cathedral Commissions program in 2008. The initial direction Larghetto, quasi siciliana provides a musical idiom that brings about a sensitive new treatment of this well-known text, affording the listener a refreshing departure from settings by earlier composers. Anthony Piccolo studied at the Peabody Conservatory in Baltimore and later at the Britten-Pears School, Snape; and the Guildhall School of Music in London. During nine years in the UK, he sang in the choirs of Canterbury, Lichfield, and St. Paul’s Cathedrals. He currently works at New York City Opera as Assistant Chorus Master, as a stage orchestra conductor, and as the Director of the Children’s Chorus. David Briggs (B. 1962) enjoys a successful career as both an organist and composer with performances around the world. An organ scholar at King’s College, Cambridge, he later served at Hereford, Truro, and Gloucester Cathedrals, and is now Organist Emeritus of Gloucester. An improvisation and interpretation student of Jean Langlais in Paris, he is also highly celebrated as an improvisor, including the accompaniment of silent films. O Lord, support us was commisioned by Jeremy Bruns in honor of his wife, Kathy, and completed in December 2005. The words are taken from the Book of Common Prayer. The Missa Omnes Sancti of Malcolm Archer (B. 1952) was written “To celebrate the 325th anniversary of the reconstruction of All Saints’ Church, Northampton, and commissioned by the Rector in memory of his parents”. It was first performed on All Saints’ Day, 2005, conducted by Edward Whiting. That the parish of All Saints’ has two organs by J. W. Walker determined the French Romantic idiom for this fine new setting of the Ordinary of the Mass. The score allows for a performance using just one organ as for the North American premiere that took place under the direction of the composer in 2006 with the Cathedral Choir of the Cathedral of St. John, Albuquerque, accompanied by Maxine Thévenot. Malcolm Archer has enjoyed a distinguished career as a choral director, composer and organist, holding positions at Norwich, Bristol, Wells, and St. Paul’s Cathedrals, and currently serves as Director of Chapel Music at Winchester College. His teachers included Ralph Downes, Gillian Weir, Herbert Sumsion and Alan Ridout. The Cathedral pipe organ was built in 2002 by the Reuter Organ Co. of Lawrence, Kansas, as op. 2210, incorporating parts of the previous Reuter op. 918 built for the Cathedral in 1950. Reviews The Diapason, ". . . Marks has done us all a service . . ."